Investors are still trying to determine the key FX themes of the year. 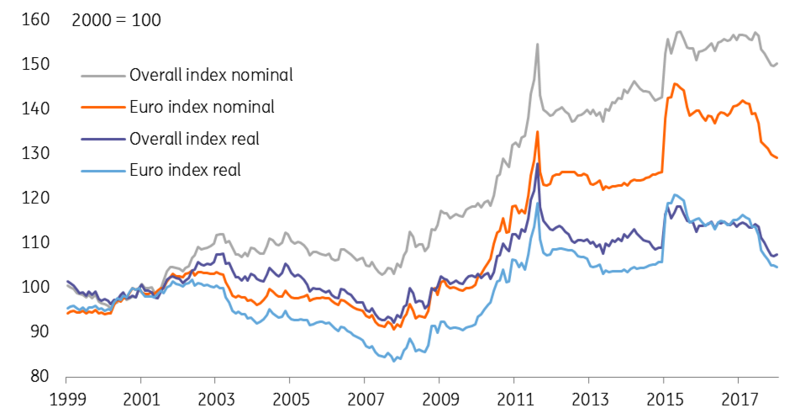 The conviction call remains that the world economy will grow, but the jury is out on whether (US) late-cycle inflation will be enough to tip over the investment environment and favour defensive FX strategies. Irrespective of the investment environment, our conviction call is that the dollar will decline multi-year – a view to which the consensus is only slowly adjusting. 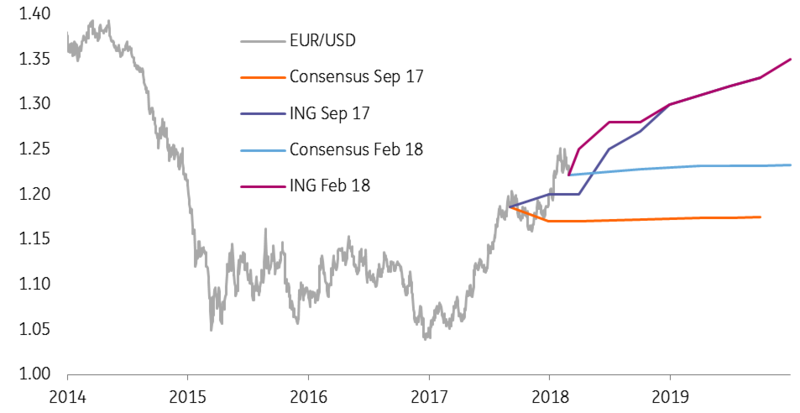 The consensus (98 institutions surveyed by Consensus Economics) now expects EUR/USD to end 2018 near 1.23 and end 2019 near 1.24. As can be seen from the chart below, consensus forecasts have recently struggled to price in significant deviations from current spot prices. The reality is that major FX pairs rarely trade in straight lines and instead it is important to build an early understanding of emerging narratives. As we highlighted last month, we are seeing early signs of a new, negative dollar narrative develop – one that questions the ability of the US to fund its growing deficits at the same cost, be that cost Treasury yields or the exchange rate. This month’s escalation in US protectionism very much affirms this theme. Our view is that Trump’s pro-cyclical fiscal policy is storing up problems for the dollar in 2019/20. Rather than waiting for the bad news in 2019, however, we think investors are starting to price that bad news into the dollar today. The ECB’s Benoit Couere touched on this theme in a speech in November when he highlighted that ‘international portfolio rebalancing considerations may, at times, drive a wedge between expected future short-term rates and the exchange rate’. We remain comfortable with EUR/USD forecasts at 1.30 and 1.35 for year-end 2018 and 2019, respectively. While the ECB may not like this, the substantial Eurozone current account surplus of 3.5% of GDP provides nowhere for the ECB to hide. And any US Treasury lip-service to a strong dollar policy at the next G20 Finance Ministers meeting on 19 March is unlikely to give the dollar lasting support. FX markets have also had some European political risk to contend with in the form of Italian elections and the SPD vote on the German coalition. These fears did not show up in bond markets, although higher volatility this year has lifted the CHF. With policy rates at -0.75% and continued intervention in FX markets, the Swiss National Bank (SNB) remains in ultra-dovish mode. No doubt it welcomes the depreciation in the CHF trade-weighted exchange rate seen last year – but still wants more. We have a very non-consensus view on EUR/CHF that the ECB’s move to adjust policy – and the SNB remaining dovish far longer than the ECB – can drive EUR/CHF to 1.25.